Automatic chucking machines are also called automatic chuckers, individually. They are machine tools not very many machinists have the opportunity to work with. 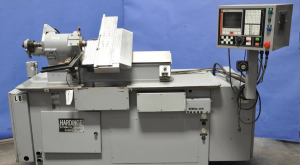 These CNC machines are part of a larger class of machine tool known as automatic lathes, an important category of equipment in manufacturing industries. Automatic lathes differ from other turning machines in the industry in that they are designed to produce high quantities of turned parts automatically. Introduced in the 1870’s, the automatic lathe began as a mechanically controlled turning machine. It wasn’t until the 1950’s and 1960’s that numerical controls and CNC was introduced, changing the way these machines were operated. Their automated nature allows them to be performing multiple different functions simultaneously which provides a steady flow of completed parts. So, where does the automatic chucker fit in and how is it different from other automatic lathes? Automatic chuckers are very similar to an automatic screw machine. Screw machines are fully automated metalworking equipment designed to process small and medium sized parts. They can produce a large amount of turned parts repetitively. Similarly, they both use one or more spindles which can drill, bore and cut the workpiece during processing. Multiple spindles allow many different functions to be performed at the same time, allowing speedier production of parts. While they are somewhat limited to producing smaller parts, they are more common in production facilities. They are not only used for producing screws, but also for a wide variety of smaller turned parts that are used in a variety of different production and fabrication applications.The larger capacity is not the only thing that sets the automatic chucker apart from others in this class of machinery. Air operated, interchangeable chucks with up to 12 inch capacity are also available. Chuckers are used in a much smaller portion of production facilities. They are typically found in smaller industry niches like parts suppliers for the automotive industry. It would not be common to find such a machine in a typical production or fabrication facility. All automatic lathes contain spindles which hold and feed material being processed. Chucking machinery typically uses multiple spindles that are used to process chucking work more commonly than bar work. They can be used to form tools and dies to be used in other operations as well. They commonly require a lot of time to set up initially, but once the machines are set up, they run quickly and efficiently. In fact, they should require little to no operator intervention once they begin producing parts. They remain much less common only because they are considered to be a specialty machine. They specialize in making large turned parts very efficiently, but the demand for mass production of large parts is somewhat limited. Although the mechanical versions have been widely replaced by CNC turning centers, many are still in operation today. In fact, many shops feel that the mechanical versions are more cost efficient for producing high volumes of turned parts.